Thinking of making your own gift baskets for the holidays? A thoughtful gift that will surely make a lot of your friends and loved ones happy would be to find what they like most and create a gift basket around that theme. And, what do most people like more than coffee? Almost everyone I know loves coffee. People drink it every day, and will even go to great lengths just to make sure they kick-start the day with this precious brew. So, here are some amazing coffee accessories gift items that you can add to your coffee gift basket. These coffee accessories will help you create the perfect gift basket for the coffee lovers in your list. First off in your basket is this black and gold thermal carafe is exquisitely elegant. The coffee connoisseur will surely enjoy the luxury of making coffee from this lovely thermos. It keeps your hot beverage warm up to 5 to 10 hours, and stays condensation free when holding your cold brew. These 6-pack reusable K-Cup replacement mesh pods from KozyCircle are a practical alternative to the Keurig pods. They are easily refillable and compatible with the Keurig filter holder. It lets you save up to 80% of the cost of single serve capsules. These reusable and refillable K-cup pods makes a great and practical addition to your coffee accessories gift basket. Vintage coffee cups have never looked as elegant as this 13-piece vintage style espresso coffee serving set. The set includes 6 porcelain cups with intricately designed brass cup holders, and a serving tray in matching polished brass in gold finish. It has an old-school Turkish/Ottoman vibe that will surely catch the attention of coffee and antique lovers alike. Make the perfect coffee every time with this Crema Pro barista kit. 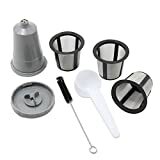 This stylish barista kit includes a coffee tamper, a 600 ml milk jug, milk thermometer, 110 mm knock bin, cocoa shaker, tamper mat and a group head brush, all made of premium quality materials. You’ll feel like a real barista with these state of the art coffee-making accessories. Learn how to properly prepare authentic Turkish coffee with this 16-piece Turkish coffee set. The set includes a thick, hand-engraved coffee pot made of fine copper, an engraved serving tray, two porcelain cups with saucers, cup holders, and lids, sugar bowls with lids, and two spoons, and two packs of Premium Mehmet Efendi Coffee. The intricately carved pieces are guaranteed to elevate your coffee-drinking experience to connoisseur levels. 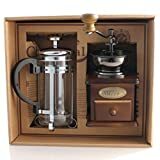 Grind your own coffee beans, and prepare your own cup of coffee goodness with this wooden manual French press and grinder set from DELISI. This classic vintage set can be used for coffee or tea making. 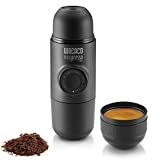 The grinder is a sturdy and durable ceramic with a built-in grinder, while the coffee press is made of temperature-resistant Borosilicate glass and stainless steel. Every coffee enthusiast will appreciate this elegant duo into their coffee making collection. One can enjoy different types of coffee with this. Most coffee lovers look forward to that frothy cup of cappuccino or latte from their favorite coffee store. The good news is, you can have one right in your own home with the help of this Savvy Coffee handheld milk frother. It creates smooth and creamy frothed milk in just a little time. 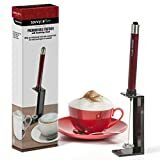 Having this amazing tool in your own kitchen lets you enjoy your coffee the way you want to – creamy, frothy, and handcrafted just for you. Another addition to our list of coffee accessories gifts idea is the Single Serve Coffee Brew Buddy from Primula. The Primula Single Serve Coffee Brew Buddy lets you have fresh and strong coffee anytime or anywhere. It’s easy to carry and fits most coffee cups or mugs. Simply put the Coffee Brew Buddy on your cup, add coffee, and pour hot water into it. You’ll instantly have freshly made coffee, brewed to your desired strength. It’s easy to use and easy to carry along with you wherever you go. The Ninja Coffee Bar Brewer System lets you enjoy a hot cup of freshly brewed java using the classic brew, rich brew, specialty brew, or over ice brew. It uses thermal flavor extraction technology to give you that rich, aromatic brew that you get from your favorite coffee shops. You can now enjoy your favorite latte, regular espresso, or iced coffee all with just one touch of a button. Never miss your favorite brew even when you are out camping with your friends. 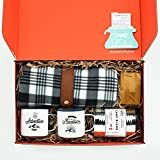 This coffee camp gift box brings together all your essential coffee accessories in a gift box. Inside are two enamel coffee mugs, coffee filters, Arabica coffee beans, a portable pour over block and a fleece blanket perfect for the cool chilly nights. Everything you need to enjoy the outdoors is inside this gift box. Scoop your coffee in style with this decorative ceramic cone-shaped scoop. Fun coffee cups and mugs decorate the ceramic handle, making it a pretty addition to your coffee accessories. It can also be used to scoop your sugar and creamer, or tea leaves. This pretty coffee scoop will make an attractive addition to your coffee accessories gift basket. Another practical coffee accessory that every coffee lover will love is this stand-alone stainless steel pour over coffee maker. It’s easy to use, needs no coffee filters, and even comes with a bonus scoop and bag clip in one. The built-in stand will fit most carafes, mugs, or cups. Simply pour hot water over the coffee filter and brew to your coffee-loving heart’s content. 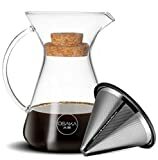 The Osaka pour over coffee brewer set features a hand blown borosilicate glass carafe with double layer stainless steel filter and a cork lid. With this coffee brewer, you can enjoy smooth, best tasting coffee without the silt and bitter taste. You can brew up to four cups of coffee every time, which stays fresh tasting thanks to the cork lid cover. Keep all your coffee pods organized in style with this Nifty Coffee Pod Carousel, which holds up to 24 K-cup packs. The carousel has a lazy susan base that rotates 360 degrees. It is made of stainless steel with a lovely chrome finish. If you are planning to get some coffee pods in your coffee accessories gift basket, this nifty carousel is a great addition to the pack. 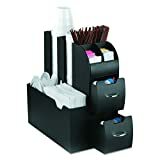 You can now create a more organized coffee station at home or at the work place with this Mind Reader Coffee Condiment and Accessories Caddy Organizer. 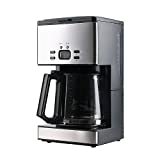 It has eight compartments to hold packets of sugar, creamer, K-cups, stirrers, cups, and other coffee making accessories, and has a sleek black finish that easily blends in with a modern kitchen design. 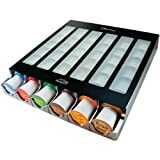 Another great addition to your coffee accessories gift basket, this Solofill Mysolopad automatic single serve cups dispenser can hold up to 42 coffee pods. It’s an easy way to store and organize your pods, as it can be placed vertically, horizontally, or mounted onto a cabinet door. Here’s another cool way to display your Keurig coffee cups. The Keurig K-Cup Carousel Tower has a 30-cup capacity, and rotates on its lazy susan base. The slim and upright orientation helps to save on countertop space, and its modern design will easily fit in with your kitchen motif. Add it to your coffee gift basket and pair it with some more coffee pods. 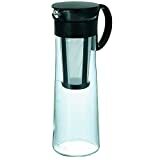 For those who prefer to have their coffee cold, this Hario Mizudashi cold brew iced coffee pot/maker is a must-have. It features a 34 ounce premium Hario glass cold brew pot with a permanent filter design so there’s no need for extra filters. Coffee connoisseurs will surely love this cold brew coffee maker. If you’ve ran out of Keurig coffee pods and want to brew your own flavors, this Xcellent Global reusable coffee filter set will save the day. The set comes with a single filter housing and three extra filters. 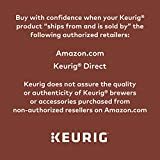 They’re easy to clean and use, and will fit most Keurig home brewers from the B30-B70 series with removable K-cup holders. These are our top 20 coffee accessories gift ideas for your friends, family, or colleagues who can never live without coffee. Assemble some of these pieces together into a beautiful package, and you will surely make a coffee fanatic happy. To delve into the world of coffee making and gather some idea about the best relevant accessories please visit our site. 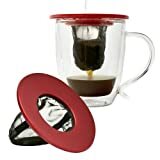 See More Coffee Accessories Gifts on Amazon!